But it's not working so well. Man, Christmas and the scale are just not good friends of mine right now! I really should just stop getting on the scale...my lovely hubby was so kind as to move it upstairs so I can now have the daily pleasure of seeing quantitative results of my overindulgence. Yikes. In light of this new knowledge, I opted for a more healthy dinner attempt tonight - inspired from "Thai it! You'll like it!" 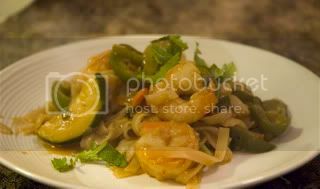 from Looneyspoons - a peanutty shrimp pasta dish. 1. Set hot water to boiling while you prep the sauce. 2. Combine the chicken stock, peanut butter, sesame oil, vinegar, soy sauce, sweet soy sauce, hot sauce and pepper flakes in a bowl. Set aside. Chop/prep garlic, ginger and veggies. 3. Cook noodles according to package directions (usually about 4-5 minutes), drain and rinse twice in cold water to keep from sticking, esp. if your dinner guests are late like mine. ;) This comes together quickly so it's best if you have everything ready to go before you start throwing things on the stove! 4. 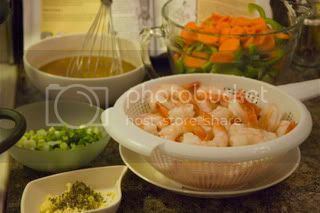 Heat a dash of olive or sesame oil in a large large pan. Add the garlic, ginger and dried basil. Cook until fragrant (about 2-3 minutes). Add carrots and cook for another minute or two. 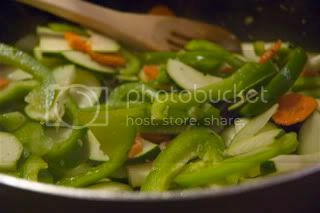 Add the zucchini, green pepper and cook until desired softness. 5. 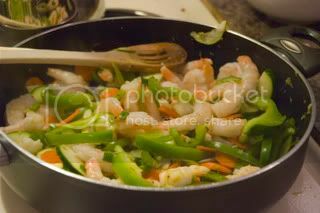 Add green onion and shrimp - cook until shrimp are heated through, and then add your sauce. Bring to a boil. To serve, garnish with some fresh coriander (or fresh basil). Yumminess. This was a little bit sweet, a little bit spicy and yummy peanutty goodness. Highly recommend. So much for healthy dins, eh? Anyway, my little bro is dropping by tomorrow so I'm planning a nice sirloin tip roast (um....yeah....hope it's tender-ish and not shoe leather-ish) and more wasabi mashed potatoes. Will update tomorrow with pics and reviews! We promised ourselves that we would head out today and actually get some real food. You see our fridge and freezer are stocked with entertaining food which usually comes out after we have run home with some form of takeout before getting the house ready for company. Why do we continue to munch even though we had dinner?!?! Thankfully we only have another couple of days of this delicious delight before we are back to the grind of regular life. I say throw the scale in the hallway closest and enjoy the fruits of the holiday season. And thanks for another recipe I must try.